‘Everything There’ by Sue Spark. Sue Spark has imagined the space of Mrs Rick’s Cupboard as an alternative zone, a non-linear space that provokes an apposite dialogue with her interest in space, time and entropic change. The Zone in Tarkovsky’s film Stalker springs to mind here as a useful metaphor. The Zone of the film is a restricted ‘outside’ space, a metaphysical space that at different times appears bucolic, dreamlike or in a state of collapse. It is a space that is fluid and uncertain. The three sequences of paintings presented here elicit a sense of dispersed or disrupted narrative through the material shifts from one image to another. These shifts, across different registers of surface and support, are interrupted by intervals or gaps. For Spark the ‘interval’ can be thought of as both a literal space between things, as well as an imagined or conceptual ‘cut’ or ‘pause’, located outside of the material image, but remaining integral to the overall reception of the work. 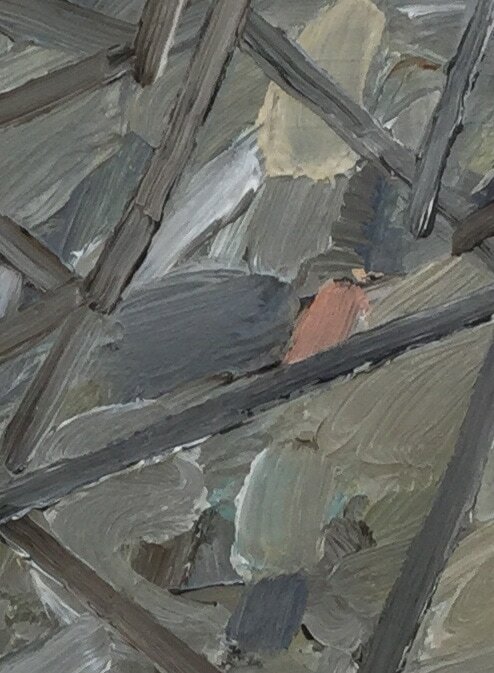 This ‘outside’ space leaks, by implication, into the paintings, alluding to a system of change, of an on-going dissolution that materialises in different phases of space and time across each sequence of paintings. Sue Spark gained her BA Fine Art degree at West Surrey College of Art and Design and her MA in Fine Art at Manchester Polytechnic. She is currently Head of Painting at Northumbria University and leads on the Colour Studio Northumbria (CSN) Research area. Exhibitions have included After Albers – Colour as Material, FAFA Gallery, Helsinki, Finland (2013), Painting Past Present, A Painters Craft, Laing Gallery, Newcastle upon Tyne (2013), Wa no Contemporary, Takamatsu, Japan (2013), Unfinished Business, Wallington Hall, Northumberland (2011), Confection, Corn Exchange Gallery, Edinburgh (2006), Present Histories, Indiana State University Gallery, USA, and touring to Heuser Art Gallery, Peoria, Illinois, USA and Kipp Gallery, Indiana, University of Pennsylvania, USA (2006), Present Histories, Red Box Gallery, Newcastle upon Tyne (2006). Spark was the Michael M Williamson Memorial, Artist in Residence at Indiana State University in 2006.